For the first time in 150 years, an all-encompassing story of the Wagon Box fight of Aug. 2, 1868, near Fort Phil Kearny, will be available to visitors on August 4, 5 and 6. 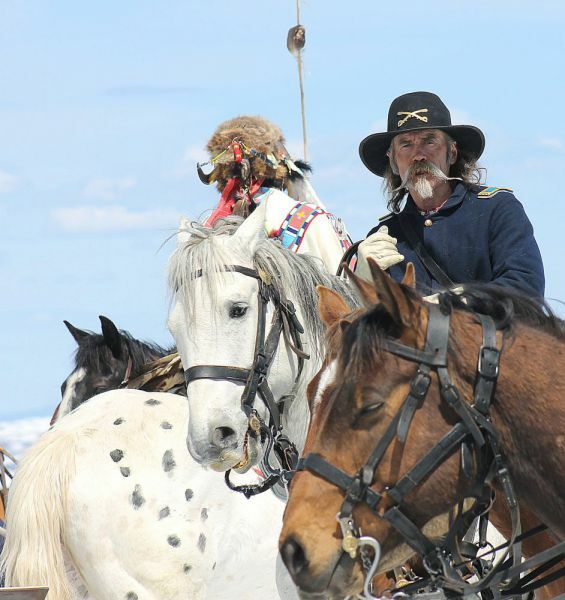 The event is the collaborative effort of the Fort Phil Kearny State Historic Site, the Fort Phil Kearny/Bozeman Trail Association, the Lakota/Cheyenne/and Crow tribes, Kearny's Frontier Regulars and the Wyoming State Parks and Cultural Resources Department. Events planned illustrate the growing understanding of the significance of the battle, and its role in the history of the Bozeman Trail and "Red Cloud's War" to the greater story of white vs. Native American conflicts in our nation's history. The battle site, along with the Fetterman Fight and Fort sites are all parts of one of the earlier designated National Historic Landmarks in our State and Nation. The designation includes land within both Sheridan and Johnson Counties, and today much of it is preserved by over 1000 acres, making these sites among the best preserved historic sites in the nation. The morning of Aug. 4 is scheduled for arrival and set up of living history organizations and individuals of historically accurate encampments for military, civilians and Native Americans. These camps will then be available to visit throughout the 3-day events. Entry fees to the fort are $5 per person. At about noon on the 4th, cash award competitions among the reenactors will include a pistol and saber competition among cavalry, rifle marksmanship with the infantry and bow and arrow shooting between the natives, followed by a brief explanation of tactics used on the plains. As the day cools, a Bar-B-Que pig dinner will be offered following a short program by Jerry Keenan, the foremost historian and author of "The Wagon Box Fight", now updated and revised for the 4th time. Kennan's newest version, available in the FPK book store, includes new information, and especially the results of the extensive archaeology done by the State in 1997. Jerry has been an Advisor to the FPK/BTA for over 30 years. Following the dinner folks may visit with Jerry and the reenactors or cool off in the valley of Buffalo Creek (the Native name for Little Piney Creek). Tickets for the dinner are due by July 28 for $19 each for adults/youth and $14 for ages 6 -10, children aged 5 and under are free. On Saturday, August 5, after the reveille call for the military and a formal flag raising ceremony visitors are invited to visit the military or civilian encampments or take a walk down to Little Piney Creek and visit the native encampment to see another version of life on the frontier. Tours will be offered throughout the morning of the Fort and sites within the stockade. Lunch will be available to purchase at the site before heading down below the Fort for seating to watch the reenactment of the battle and narrated depiction including questions from the audience. The show will begin with an initial attack on the side camp and follow the oral, written eye-witness and archaeological accounts through to the final shots of the howitzer and withdrawal of the Natives. Tickets are available up to the day of the event for $20 (ages 11+) from the FPK web site at www.fortphilkearny.com. Visitors ages10 and under are free. The plan for Sunday, August 6 will continue with Native, military and civilian encampments through noon. At 10 a.m. an air-conditioned bus with bathroom, and including lunch, beverages and a snack, and most important, will begin with a tour to the actual site of the Wagon Box Fight as well as to wood cutting activities, block-houses, ambush locations and other points of interest necessary to better understand the events of the actual fight 150 years ago. Cost of the bus tour is $45 with reservations due by July 28.